When it comes to a landscape makeover in Minnesota, planning ahead of time is always good before the spring comes around. By the time the weather warms up, both you and the landscaping contractors in the Minneapolis area will be fairly busy, so why not take advantage of the winter downtime and get a jump on your planning right now? As you’re thinking of enjoying the warmer weather this spring and summer, you may want to consider turning more of your yard into hardscape areas such as patios, terraces, and paved walkways to cut down on lawn care. Hardscaping – to look like it fits right in with the rest of your landscaping – needs to be well planned. Hardscapes are not maintenance-free, but they are much easier to care for than grassy areas. You can use a lot of different hardscape materials to make a driveway or walkway such as gravel, brick, stones and asphalt. Concrete might be the way common to go when it comes to these areas, but that is not always true.You have many options to choose from, and each will give the driveway or walkway a different look. 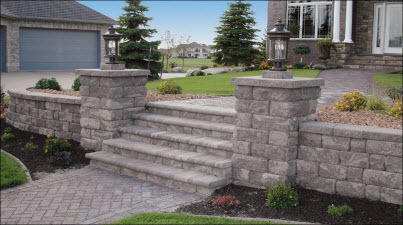 A MN landscape designer like we have at Architectural Landscape Design can match or coordinate the hardscape materials with the rest of the landscaping as well as your home to give your house and yard a pleasing overall appeal as well as a unique look. When it comes to your hardscape planning, think about having a rock garden. These also require much less attention than a green, green garden with lots of flowers. You can add flowers to your rock garden but they usually are the types that can survive any type of condition. Rock gardens often do well in spots where traditional garden beds won’t work, such as on hillsides or in shady areas.Decks and patios are an important thing to think about when planning your landscape. You can relax outside on outdoor rooms, or spend some time entertaining guests, or even cook for your family and friends outdoors. We often suggest hardscaping for the sections of your yard where plants and trees wouldn’t be able to grow so well. This allows you to utilize the unused space in the yard. Water features such as fountains, pools, and spas can also be added to you yard. You can get a beautiful sound and a focal point as well as the refreshing that water brings. One of the biggest thing to think about with your planning is how big and elaborate you want it to be. You shouldn’t have to spend a lot of money to put something small and delicate in the yard but if you’re going with a large pool, then you’re going to be spending a decent amount of money to have it put in. There are many smaller water features that can be put in and are just as lovely. But whichever you’re leaning toward, working with a landscape designer to make sure the water feature you have in mind will work well in your yard is important. When it comes to hardscaping, think about having a rock garden. They also require much less attention than a green, green garden with lots of flowers. You can add flowers to your rock garden but they usually are the types that can survive any type of condition. Rock gardens often do well in spots where traditional garden beds won’t work, such as on hillsides or in shady areas. Hardscapes are an important part of landscape as we know it, and they can provide an attractive yet utilitarian look to the yard overall. Hardscapes may also be able to save you more time and money over a long period of time, as long as they are planned and installed correctly. Speak with us at Architectural Landscape Design to see how we can make your dream into a reality when the spring time comes around – call us now at 952-292-7717 for a planning consultation. Working with Minneapolis area homeowners planning for spring is one of our favorite parts of the winter season!